Resist by [art’s] form alone the course of the world, which permanently puts a pistol to [our] heads. 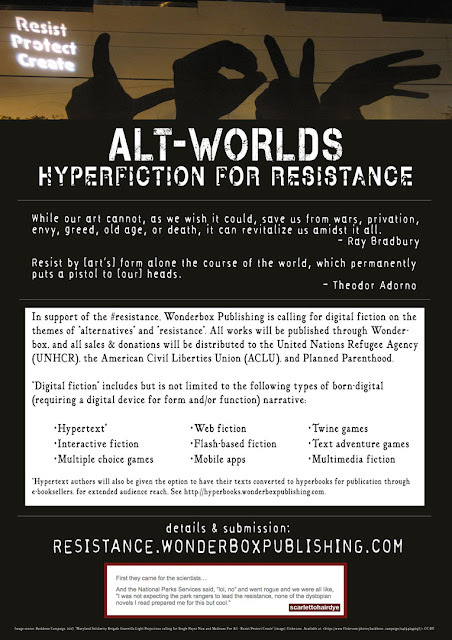 In support of the #resistance, Wonderbox Publishing is calling for digital fiction on the themes of “alternatives” and “resistance”. All works will be published through Wonderbox, and all sales & donations will be distributed to the United Nations Refugee Agency (UNHCR), the American Civil Liberties Union (ACLU), and Planned Parenthood. *Hypertext authors will also be given the option to have their texts converted to hyperbooks for publication through e-booksellers, for extended audience reach.